I worship You and I adore You. I love You Jesus with all my heart. Draw me and I shall be drawn into Your Presence, that is so rich in Your Glory. I long and seek for it. For Your Presence changes my inner being to the being of God. As I enter to the Sanctuary of the Frangrance of Christ in His excellence. For I shall be now a Fragrance of Christ to God among those who are being saved and among those who are perishing. I can know Your Presence now as real as You are Jesus. For Your Presence is Your Person. I experience the intimacy with You Jesus through Your fragnance of Myrrh – the suffering of Jesus and the Love for God. Master You are the Saviour and the Love of God in Person. Let me unite the Love of my heart with the Love of Your heart that is Your Person in the Spirit Jesus. As the deep calleth unto deep, so the heart of God and heart of my inner being unite in Perfect Love. As the Presence is so rich I experience the fragrance of the Cinnamon the purging of my inner being from the past sins through Your Spirit Jesus. Jesus as the Grace You appeared to the eyes of the world. The Fragnance of Cassia. Jesus You humbled Yourself and gave up the Glory which You had with the Father before the world was, Glorifying the Father on earth, for it pleased the Father that in You Jesus all the fullness should dwell. Transform me to be a two edged sword to help me to carry the Fragrance of Jesus as I seek the Guide to share Your Divine Fragrance with the suffering world. I want to comfort you Master. I am here for you to share with you my love. You have always comforted me Holy Spirit. Now through your Spirit Jesus I want to comfort You with the silent tears and whispers of my heart as the Holy Spirit interceeds for me with groanings which cannot be uttered. I can feel Your Presence now and Your Person Master as Real as life itself. Your Presence is full of Life and full of Your being as I worship You. Now that I have come to the Sanctuary. Heal me. Take away my infirmities. Transform my spirit. Heal my body, soul and life. Bring restoration and a new Fresh Vision and deepening of Your Anointing Holy Spirit. Use me as a Prophetic vessel. And impart Your wisdom and healing power upon me Jesus. 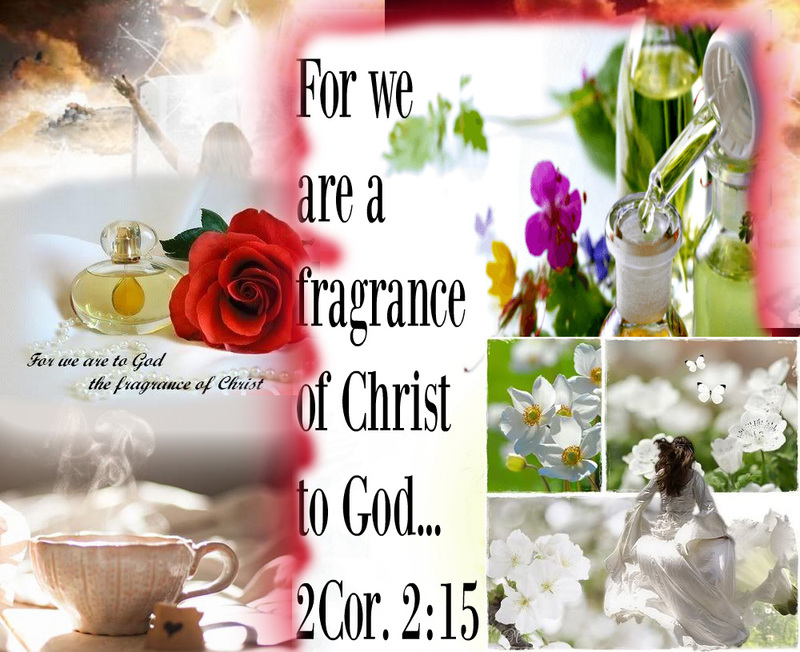 So I can share Your Fragrance of Christ.